Have I mentioned before that I love blueberries? I really love them. They are probably on the expensive end when it comes to fruit, but that is okay. I have a wonderful solution! 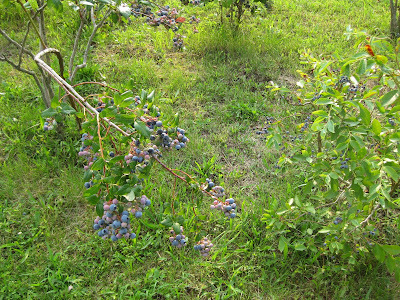 Mark's parents have blueberry bushes! I wish I could take a picture that really showed how wonderful these bushes are. (and how many bushes they have!) 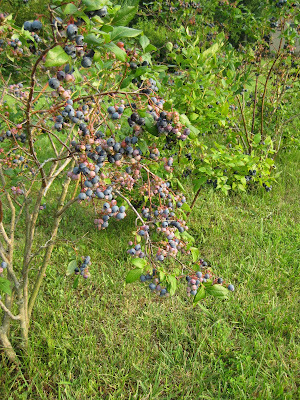 These wonderful blueberry bushes greet us as we pull in the driveway. A fresh pint is waiting on the kitchen table every weekend. Mmmm...it is wonderful and they are the most delicious blueberries you could ever imagine. Homegrown and fresh-picked. It exposes you to the truth of what fruit really can taste like! 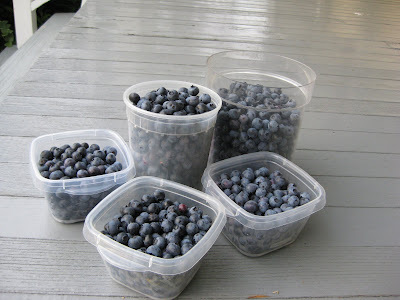 So, on our most recent visit, Mark and I returned a favor to his parents by spending about 30 minute picking. It was a great time, Mark and I being together in the quiet of the Eastern Shore. Plus, picking fruit is always fun for me and reminds me of picking raspberries in my grandparents back yard when I was a kid. Growing up I loved going strawberry or apple picking at local orchards. Ah, the memories. And they are good. We have been hiding them from ourselves as not to eat them all in one swoop. Yummy! 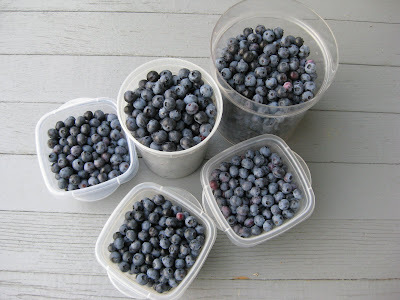 Did you know that July is National July Belongs to Blueberries Month? I need you hear to walk with me to the farmer's market on Fridays!